Home » Latest News » Welcome to BoothsandOvens.com’s Tips & Tricks! Every month or so we’ll talk about simple tips and tricks you can use to get the most out of your finishing equipment. Our kick-off article this month explains what equipment you’ll need if you want to start your own powder coating business. Whether you want to do one set of wheels at a time or thousands of parts per day, you will need a powder spray gun, a powder spray booth, and a powder curing oven. This equipment is essential if you want to get professional quality results. The Powder Spray Gun uses compressed air to spray a cloud of powder onto the part. It applies an electrostatic charge to the powder, which causes the powder to stick to the part (because it is grounded). The powder is either stored in a metal hopper that is connected to the gun by a hose system, or a pick-up tube attached to the gun draws the powder directly from the box it was shipped in from the powder supplier. These two types of guns are called Hopper-Fed Powder Spray Guns or Box-Fed Powder Spray Guns. A third type of powder spray gun is available. It draws powder from a small container attached directly to the gun body. This type of gun is called a “cup gun,” and is typically used only for hobby or laboratory applications. Gema, Nordson, and Wagner are all well-known manufacturers of professional quality powder spray guns. 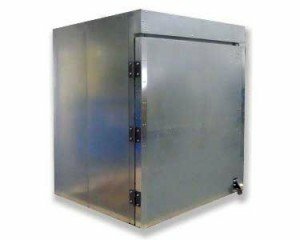 The Powder Spray Booth is a ventilated enclosure that keeps the powder cloud contained so it won’t get into the rest of the shop. The spray booth also gives the operator the lighting and air movement he needs to efficiently powder coat parts. The part being coated needs to be well lit. Air movement is important because it causes the cloud of sprayed powder to move away from the parts–allowing the painter to easily see what he is working on. Booths are typically designed with an exhaust that pulls air out of the booth and passes it through a filter system. Booths usually have either a cartridge filtration system that uses pleated, tubular filters, or an array of disposable filters, known as a disposable filtration system. Booths with cartridge filters are more expensive, but the filters last for a long time. Booths that use disposable filters are much less expensive, but the operator has to replace the filters on a regular basis. This costs money and adds to down-time. Either cartridge filters or disposable filters can be used on powder spray booths that have a spray-to-waste design. These booths are intended for situations where the powder that doesn’t stick to the parts will be discarded. Most small manufacturers, fabricators, and powder coating shops use these types of booths. If the coater wants to reuse the powder that did not stick to the parts, he will need to have a booth that features a powder reclamation system. These systems use cartridge filters and usually include a way to pump spent powder from a collection area to a device that reconditions the used powder and blends it with virgin powder. The blended powder is returned to the powder spray gun and applied to parts. Reliant Finishing Systems is a well-known manufacturer of powder spray booths. The Powder Curing Oven heats parts after they are coated with powder. The powder that was sprayed onto them melts and flows together. This produces a resilient and uniform finish once it cools. Ovens suitable for use in a professional powder coating shop will typically have a maximum operating temperature of 450°F or higher. There are two main types of curing ovens, electric curing ovens and gas-fueled curing ovens. Electric ovens are usually smaller in size (typically 6’ x 6’ x 6’ or smaller) because of the extremely large circuit sizes needed to support electric ovens that are roomier. Gas-fueled ovens can be configured to operate on either LP gas or natural gas. They can be very large in size and are typically the most cost-effective ovens to operate. A third type of powder curing oven exists that uses infrared emitters to heat the surface of the parts. They are known as IR curing ovens. These ovens are less common because they are very expensive and the infrared heating doesn’t work well with parts that have complex shapes (because the infrared rays cannot reach the entire surface of the part). Sometimes a group of infrared emitters are arranged so that they pre-heat parts before they enter a conventional oven, in order to shorten the total curing time needed. Because the most common way for most shops to perform powder coating is to batch their tasks and coat multiple parts (or multiple jobs) all at the same time, the ovens used for this process are typically called batch ovens. In higher-volume production shops, the oven may be part of an automated coating line where a conveyor moves parts through the oven at a pre-set rate after they have been coated. Equipment that helps you clean off dirt, rust, grease, oils and old paint before you apply a powder coated finish is called Pretreatment Equipment. As a general rule, the cleaner and more uniform the surface of the part is before powder coating is applied, the longer the powder coated finish will last. Pretreatment usually comes in two forms for powder coating: blasting (usually with sand, steel shot, or special blasting media like aluminum oxide) and washing (usually using detergents and/or chemicals). Blasting helps remove scaling and other debris to get a clean surface for the powder, and it helps add texture to the surface of the parts so the powder can adhere better. Washing can be done using steam, heated pressure washing, or spraying at room temperature. Most systems apply a chemical mixture that helps remove oils and solvents from the parts, and may also make the surface of the parts more receptive to the powder when it is applied. As with blasting, this results in a stronger powder coated finish. For more information on pretreatment, check out the Pretreatment Primer, here. Make a plan for your shop. Determine your throughput goals and lay out the path that parts will follow as they are coated. Let this plan guide you when you size the equipment and select where you will install it. 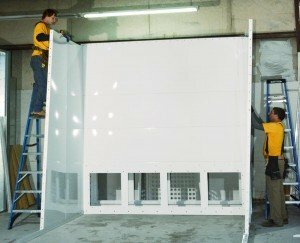 Estimate how many parts per day you need to coat and how big they will be, then work with a powder coating specialist to determine how large your equipment needs to be. 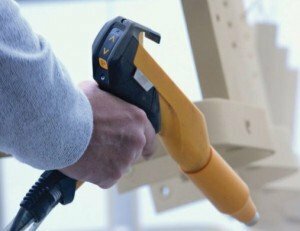 Measure carefully and take into account the space you have to work with before you order powder coating equipment. This simple step can make a big difference in the success of your powder coating process and can save you days or weeks of headaches by preventing installation issues. For more information on sizing your equipment and planning out your new workspace, check out the Oven Size Guide and Booth Size Guide. For more information on starting out as a professional powder coater, check out our in-depth guide, the Beginner’s Guide to Powder Coating or feel free to contact us at (256) 513-6139. We’ll be happy to help you get started! This entry was posted in News on January 22, 2018 by Reliant Finishing Systems.